There’s no other way to say it, the last thirty-one days have been an unbelievable ride! On June 1, I woke up early—even earlier than my usual 4am—and rushed to my phone the same way my kids run to the tree on Christmas morning. When I finally turned it on and rubbed the sleep out of my eyes, there it was—TAKEOFF was actually, really, finally available to real, live readers. Through the rest of the month, TAKEOFF soared higher than I ever imagined. 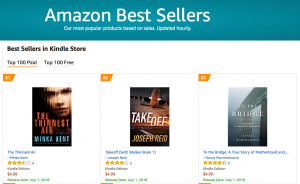 Being selected for Amazon First Reads allowed Prime customers to sample it early, and they sure did: the book hit #1 on the Action/Adventure, Mystery, Military, Kidnapping, and Police Procedural charts, as well as #2 on the Kindle chart and #11 on the Most Sold chart. At various points, I found myself ranked ahead of names like Baldacci, Patterson, King, and Rowling. I mean…seriously? 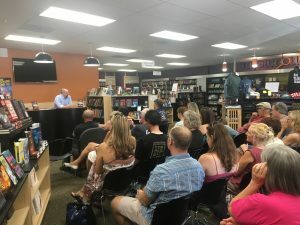 Yesterday, I got to live out another dream: my first author event. 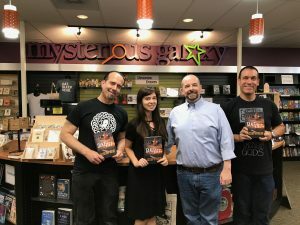 Fifty or so people showed up at my hometown store, Mysterious Galaxy, to hear about the book and get it signed. Simply amazing! Then, yesterday, I got to live the release day dream all over again. 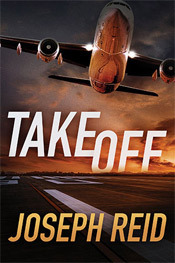 TAKEOFF went live to everyone, and I got to see it reach a whole new batch of readers. And the ride’s just starting: we’ve got another signing this coming weekend, and then it’s off to ThrillerFest. Throughout this entire process, the best part has been people’s reactions. Friends and relatives blowing up my phone. Classmates posting about how the book is doing. Colleagues I haven’t heard from in a long time coming to my signing. Even strangers writing to me here at the website to say they enjoyed it and ask when another book is coming. It’s been amazing! Thank you all! Thanks for taking a chance on TAKEOFF, and on me. Thanks for spending your hard-earned money and your valuable time on it—I know how precious both of those can be. And, if you liked it, thanks for caring enough to write a review, or tell friends about it. This month has been an absolute dream, but it never would have happened—and it certainly wouldn’t have been the same—without each and every one of you.